Cuadrilla finally started fracking of the UK’s first horizontal shale well, Preston New Road-1z, Lancashire, on 16 October 2018. Very small tremors were immediately registered on the monitoring network set up by the BGS. I have positioned the five tremors of 18-20 October on the map below, shown by the red crosses. They lie towards the western end of the horizontal segment of PNR-1z at 2240 m depth (the surface track of which is shown by the red line). Fracking started with the stages furthest from the wellhead, that is, at the west end. The BGS hypocentral depths are very approximate (2 to 3 km depth), and the epicentral positions all lie within 300 m of the well track. Location of Preston New Road-1z, currently being fracked (red line). Thin black lines are 2D seismic profiles; the blue one highlighted is shown below. Red Xs mark the epicentres of the five tremors triggered to date. Grid at 1 km spacing (click to enlarge). The three tremors of 18 October are tiny, and well below the M = 0.5 limit for the traffic-light monitoring system, which is itself very small. However, recent research by Stanford University shows that these tiny tremors can be indicators of bigger quakes to follow, like canaries in a coal-mine. The 19 October event with M = 0.3 is close to the red threshold (M = 0.5) of the traffic light system, at which fracking must stop. The fifth and latest tremor, at the time of writing (22 October) is M = 0.0. However, triggering of earthquakes during fracking is, in my view, a subsidiary issue. My overall concern is that Cuadrilla is failing, even after nine years in the Fylde, to understand the geology. Part of a 2D seismic reflection line is shown below, with my geological interpretation and with the deviated well track superimposed, to illustrate this point. To cite one example of Cuadrilla’s incompetence: a supposedly 400 m thick layer of Millstone Grit, mapped by Cuadrilla as late as last year to overlie the Bowland Shale, was proved by PNR-1 (the vertical donor well for the horizontal PNR-1z) earlier this year to be completely absent. This Upper Carboniferous layer should have been found, according to Cuadrilla, between the Bowland Shales and the Permian sediments above. Cuadrilla’s mis-mapping and misunderstanding after all this time constitutes a severe geological failure. The usual mismatch between the geological prognosis and the actual outcome when drilling in a supposedly well-understood basin is routinely just a few metres in layer thickness differences. Interpreted 2D seismic profile located in blue on the map above. Vertical scale is in seconds of two-way reflection time. PNR-1z is the red dashed/solid line (click to enlarge). 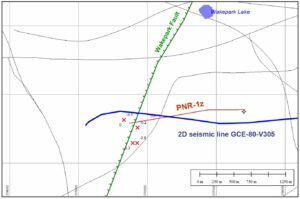 Furthermore, Cuadrilla appears to be hiding the fact that there are major faults in the near-vicinity of the PNR wells, which extend up to the near-surface, as shown in the seismic example above. These could be future conduits for contamination from fracked shale. One of these, the Wakepark Fault (green on the seismic section), runs in a NE-SW direction nearly through the Wakepark artificial lake, 1300 m north of the horizontal well. According to all the information Cuadrilla has seen fit to publish, this fault does not exist, even though it was originally mapped at depth independently by Eukan Energy and by British Gas some thirty years ago. I have merely remapped it, taking it higher up. 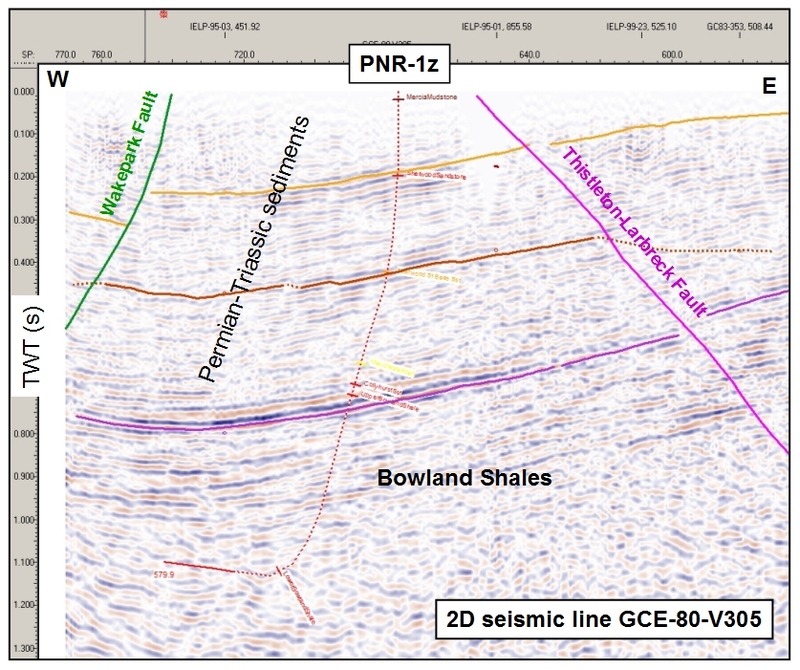 The map above shows the surface outcrop of the fault; at the depths of the Bowland Shale this fault lies about 1 km west of the toe of PNR-1z. The four freshwater springs replenishing this lake may be being fed by water from the underlying Sherwood Sandstone aquifer, via the fault. 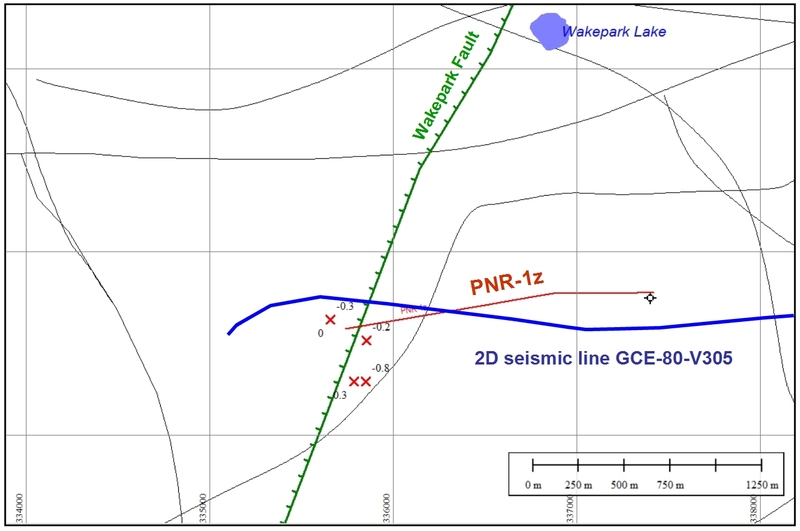 Cuadrilla’s published cross-sections through PNR, including cross-sections submitted in its planning applications, are all truncated in such a way as to avoid showing any of these faults. Although I currently have access only to the released 2D seismic database, as in the example above, it is evident from the several small samples of the 3D survey published by Cuadrilla, and on which Cuadrilla’s geological picture depends, that the 3D survey is not up to the task. This is particularly true at the SW corner of the 3D survey rectangle where PNR is situated. The data processing strategy seems to have been biased towards obtaining strong horizontal smeared-out reflectors in the Bowland Shale, at the expense of imaging the faults. Cuadrilla belatedly asked the Oil and Gas Authority to withhold release of the 3D survey, which should have become publicly available on 1 January this year, and which I had pre-ordered over a year ago. It took several FOIs and a letter threatening legal action from my brilliant lawyer Kate Harrison, of Harrison Grant Solicitors, London, to get the OGA finally to authorise release of this survey some 10 months late – but even now I have not actually received it. In my view the government is doing everything in its power to delay the due release of data that might be used to argue against Cuadrilla. That is not sound regulation; it is giving the cowboys free rein. 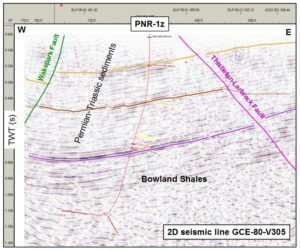 The Bowland Shale is riddled with faults that Cuadrilla either does not recognise, as cited above, or else wilfully seeks to misplace. An example of the latter is the fault that was intersected by the Preese Hall-1 wellbore in 2011, triggering the earthquakes there during fracking. I have shown that the wellbore cut the fault, and the later fault displacement due to the earthquakes ovalised the drillpipe to such an extent that the well had to be abandoned. But Cuadrilla persists in positioning the fault to the east, away from the wellbore. Some of these shale layer faults extend up into the Sherwood Sandstone aquifer and higher up, as shown in the section above. If and when Cuadrilla starts drilling and fracking at its other current site, Roseacre Wood, the problems of faulting and of general geological interpretation will be even more severe than here at Preston New Road. My strong impression is that Cuadrilla is once again trying to hide its own technical incompetence. I recall the letter from DECC energy minister Charles Hendry of 11 May 2012 calling into question Cuadrilla’s “performance as a licensee” – a rare rebuke by government to industry. I recall also that Cuadrilla boreholes Grange Hill-1, Singleton-1 and Anna’s Road-1 had severe technical problems in addition to those at Preese Hall-1, resulting in abandonment of all four wells – a 100% drilling failure rate! Note the disingenuous “at the time” disclaimer above (discussed in more detail by Refracktion), belying the fact that tremors frequently occur some hours after cessation of fluid injection. Furthermore, there is no published information on the times when Cuadrilla claims to be injecting, so the assertion cannot be verified independently. To quote Cole Porter; “There may be trouble ahead“. Cuadrilla’s only safe option is to cease fracking the critically stressed Bowland Shale. Otherwise Francis Egan, Cuadrilla’s CEO, will have to “face the music and dance” – but I don’t think Egan will be as nimble on his feet as Fred Astaire.